Copy and paste the letter, print it out and send. Write the German Government to Free Political Prisoner Ernst Zundel. 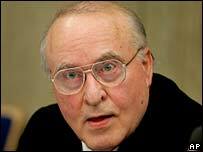 Please write the German Chancellor Angela Merkel and demand therelease of political prisoner Ernst Zundel. You may send the letter directly to her or, even better, send it tothe nearest German Embassy of Consulate and ask that it be forwarded to her.Thus, your letter gets seen and recorded twice. Below this letter is a list of contact addressed for German diplomaticmissions around the world. We are Canada's leading free speech advocacy group. We believe thatfreedom of speech and freedom of the press and freedom of expression arenatural extensions of freedom of conscience. I must say that we were appalled by the ruthless sentence of 5 yearsin prison meted out to political prisoner Ernst Zundel by a court inMannheim on February 15. Incarcerating peaceful dissidents for expressing their opinions isunworthy of a civilized state with Germany's history of intellectual endeavour and creativity. Intellectual creativity requires freedom. We note with dismay that the sentence seems to contradict a keyelement in the German Constitution; to wit, Sec. 5.1: "Everyone has theright to freely express and disseminate their opinions orally, in writing or visually and to obtain information from generally accessible sources withouthindrance. ... Freedom of the press and freedom of reporting throughaudio-visual media shall be guaranteed. There shall be no censorship." Expressing his opinions in writing was all Mr. Zundel ever did. We urge you to use your power to grant him clemency and to immediately release Mr. Zundel. As well, we find it distressing that your government seeks to pressure the nations of the EU to adopt a common law that would jail people for questioning the establishment account of World War II as it relates to the treatment of interned Jews. Not to be able to question, explore or revise history leads to stagnation and ignorance. No historical accountshould be immune to question and debate. Such a censorship law comes dangerously close to creating a new state religion and to jailing dissenters as heretics. We believe that such repression is unworthy of Germany as a nationthat has always cherished its intellectuals. As a person who lived under a repressive dictatorship and state censorship in the former DDR (German Democratic Republic), we would hope that you would be especially sensitive to attacks on freedom of speech. It would be best if you were to send your letter to one of the American consulates and request of them to forward the letter to Germany.